Battery (with some sort of external circuitry for making sure the voltage is correct.) This is also used sometimes in conjunction with solar panels to act as a "buffer." USB is often used for small projects that are on the breadboard and don't require much power (no motors, etc.). 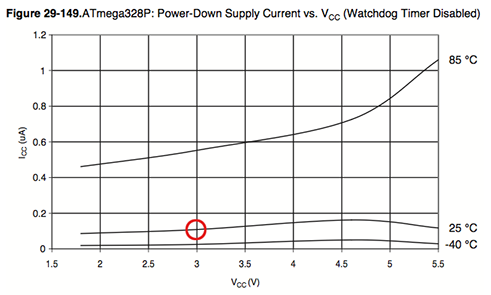 The circled area shows 100 nA consumption when running from 3 volts at 25 °C with the watchdog timer (and various other things) disabled.